LASD Recruitment hosting Deputy Sheriff test on Saturday, Feb. 23, 2019 @8am at Antelope Valley College in Lancaster! recruitment team is coming to Lancaster! On Saturday, February 23, 2019 at 8am, LASD will be hosting the Deputy Sheriff examination at Antelope Valley College. There is no need to travel down south to take the test, AVC is located at 3041 West Avenue K in Lancaster. 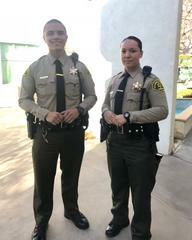 Check out www.lasdcareers.org for qualifying requirements and make sure you follow LASD Recruitment Unit on Instagram and Facebook for all the updates! We can’t wait to have to you be a part of our tan and green family. My hero wears a badge, and you can too.